Oxford Genetics offers a range of secretory tags for use in bacterial cells in easy-to-clone formats. Oxford Genetics provides versatile cloning plasmids containing the bacterial secretory tags listed below. Simply inserting your gene within the MCS will introduce the secretory tag onto the N terminus, and allow it to be automatically removed by cleavage during secretion. 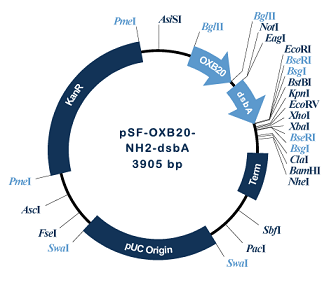 The structure of a plasmid encoding the Dsba secretory tag is shown in the diagram. Each of these proteins is provided in a vector allowing N-terminal fusion with your gene of interest by inserting it into the MCS. The tag will be automatically removed by cleavage during secretion. The vectors usually also include kanamycin resistance to enable simple selection of transfected bacterial cells. We have had particular success using the OmpA and PelB secretory tags, and we provide the world’s most extensive range of products using those particular tags in a very broad range of formats. For example both OmpA and PelB-containing plasmids are provided with additional epitope and affinity tags, allowing simple identification and/or purification of your expressed proteins. These tags include hexahistidine and decahistidine, V5, C-Myc, T7, haemagglutinin and several others. Please see the ‘view products’ button below, or use the Plasmid Finder on the Home Page. Many of our plasmids that contain functional tags (eg. Epitope tags, in addition to secretory tags) also contain simple protease cleavage sites. This allows you to remove the tag, if you so desire, following protein production and identification/purification. 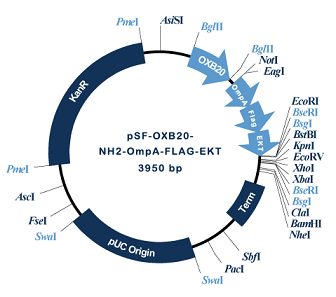 The structure of a plasmid encoding the OmpA secretory tag, with Flag tag and EKT cleavage site is shown. We sell a broad range of cleavage sites, including sites for EKT, Factor Xa, Thrombin, TEV, 3C (Prescission) etc Because we provide a large number of products with three components (secretory tag, additional functional tag and cleavage site) we have tabulated them below to help you identify which plasmid you need. For simplicity, all of our tags are positioned upstream of the MCS and will be included at the N terminal of your inserted protein sequence. This should be sufficient for all needs, however do contact us if you require C terminal tags, as these are very easy for us to provide.